The 2014 Kia Cadenza will begin showing up in showrooms around the U.S. this week as the flagship in Kia's sedan offerings goes on sale to the public early. With only one trim package but two option levels, the 2014 Cadenza boasts a host of standard and optional features for the premium sedan segment. The starting MSRP for the 2014 Kia Cadenza is $35,100 plus $800 destination and handling. This base level includes class-leading interior room, keyless entry, advanced navigation, SiriusXM Traffic and UVO eServices, Bluetooth technology, an 8-inch touch screen, 550-watt Infinity 12-speaker audio, a rear camera, and leather-trimmed seats with heat and power adjustments in the front. Two optional amenities packages are also available: Luxury and Technology. At $38,100 plus destination, the Luxury Package adds a full-length panoramic sunroof, power retractable sunshade, Nappa leather trim, heated rear seating, a ventilated 12-way adjustable driver's seat, HID headlamps with the adaptive front lighting system, a 7-inch LCD instrument cluster for customization and clarity, heated steering wheel, and two-driver memory settings for seating and mirror adjustments. The Technology Package adds to the Luxury Package puts on 19-inch alloy wheels, an electronic parking brake, Advanced Smart Cruise Control, a Blind Spot Detection System, and Kia's first Lane Departure Warning System at a $41,100 price point, plus destination. 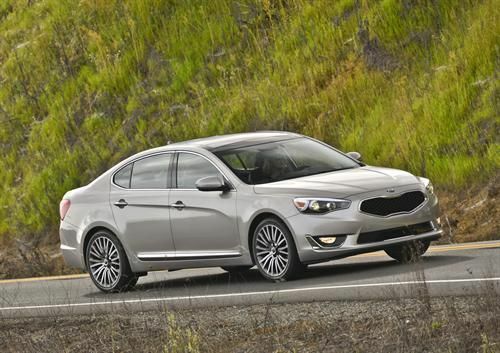 The 2014 Kia Cadenza is powered by a 3.3-liter V6 (293 horspower) with gasoline direct injection (GDI). That engine couples to a six-speed automatic transmission.